History: This temple was built by Cholas in 9th Century. 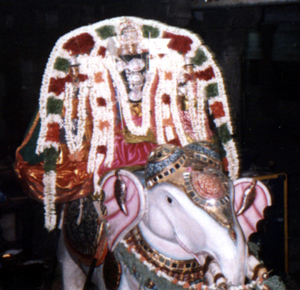 Later Thirumuruga Kirupananda Variyar helped a lot to renovate this temple. Epigraph (Stone Carving): This temple historic perspective is presented by Epigraphical Department of the Archeological survey of India, which has copied as many as 20 inscriptions (1937,138-157) found on the deva goshta walls of Siva Temple. They all contain evidence to say that this temple has received by royal benefactions of the Cholas etc. and other chieftains. Most of the endowments are for to provide pooja lamps etc, and for the expenditure towards furnishing with ornaments to idols and deities during festival days.